I'm interested in Prohibition : how it happened, how it was/was not enforced, and particularly how it has shaped America's drinking culture, laws, and preferences, right down to the current day. So I like reading books about the era, and there have, happily, been some good ones out lately after a long period with nothing (and the Ken Burns documentary , too). Christine Sismondo's America Walks Into A Bar goes a step further; quite a few steps, actually. Sismondo starts in colonial America -- early colonial America -- and reveals something I'm pretty sure I never heard before: it's quite likely that the Salem Witch Trials had, at their base, competition between two families of tavern owners. It started with a "tax" revolt (a refusal to supply firewood to a hired preacher), and the bad feelings grew as the competing taverns tried to get more of the traveler trade. Sismondo uses this to show how the tavern -- the bar, the public house, the inn -- has been at the center of so many American movements. Another one? The gay rights movement. Bars -- often raided by homophobic police and politicians, and just as often re-opened -- were natural gathering places for homosexuals; rules were already lax in bars, and the door was traditionally subject to control. Sismondo tells tales of bars run by characters like Big Nellie in New Orleans (and her regulars: "Lady Richard, Lady Beulah Toto, Lady Fresh and Chicago Belle"), Fat Tony Lauria, the New York mobster who opened the Stonewall Inn -- where gay rights would become direct action -- Paul Ruquy (who ran The Tool Box in San Francisco), and the legally nimble Sal Stoumen, who ran the Black Cat Cafe in San Francisco -- site of much of the madness in Kerouac's On The Road, and a favorite of Allen Ginsberg, William Saroyan, and John Steinbeck. Jose Sarria, a Black Cat waiter turned drag performer, ran for city supervisor in 1961, 12 years before Harvey Milk ran for office; and he almost won, according to Sismondo. She covers Prohibition as well, of course, and Shays Rebellion, and the Whiskey Rebellion, those last explosions of revolutionary thinking that would be tamped down by the strengthening federal government. She talks about the labor movement's association with bars, ethnic groups that felt at home in bars, how women came to feel at home in bars (in unregulated speakeasies, and they'd never leave, happily!). That's her theme throughout the book: bars and taverns were places where people met, discussed grievances, and often decided to take action. Or action against the bars: she covers the growing temperance movements of the 1800s, and the political corruption associated with the bar business (and the brewing and distilling industries) that gave temperance the solid footing to succeed politically in a modernizing climate. Sismondo brings new stories to light -- and believe me, I've heard a lot of them, but I was happy to see new ones in plenty here -- but never falls into dry scholarship. Even given the material, this could easily have been a tediously overwritten book, but -- as is almost promised by the dustcover photo, posed with cocktail glass in hand -- Sismondo is a better host than that. The footnotes -- thank you! -- show the scholarship and research, but the writing is great race-along stuff; interesting, amusing, and beguiling. I've talked about the loss of the neighborhood bar myself, and perhaps prematurely mourned it. Sismondo's final chapter reassured me; action does still take place in bar, though it may seem to be a bit anticlimactic compared to the titanic struggles over liberty and individual freedom that America's bars have hosted in the past. She discusses how live music became allowed in bars (it wasn't before? Who knew! ), how smoking is more often not being allowed, and finally, the kiddie revolt: overbearing parents bringing kids to bars, blocking the floor with huge strollers, and allowing the little ones to run around unchecked...hey, I took my kids to bars, and they behaved, dammit! 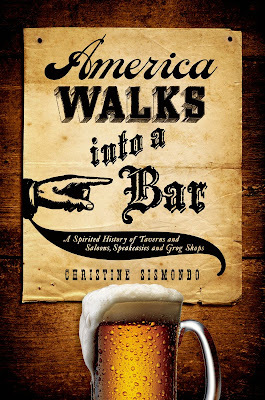 Sismondo has a book here about what bars have meant in America. We've loved them, hated them, banned them, embraced them, argued in them, sung and danced in them. You'll feel positively warm about them after reading this fascinating book.